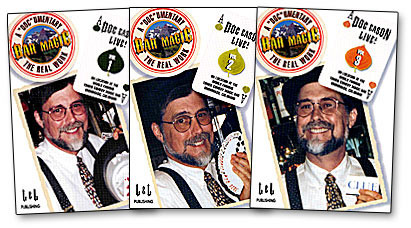 Today, when you order "Bar Magic Doc Eason- #3, DVD", you'll instantly be emailed a Penguin Magic gift certificate. You can spend it on anything you like at Penguin, just like cash. Just complete your order as normal, and within seconds you'll get an email with your gift certificate. Order in the next 6 hours 6 minutes and it will ship TODAY! Your front row seat is reserved for this rare, in-depth look at the working repertoire of the master bar magician of our time. Peppered with lines, bar bits and jokes, this "Doc"umentary features guarded, highly commercial secrets which bring celebrities and locals back again and again. Twenty years of non-stop performing at the Tower have turned Doc Eason into a pro at the top of his form. You'll watch these tapes over and over for the sheer joy of seeing how much fun magic can be. All Screwed Up-a hilarious opening trick using hardware! Impossible Opener-a cornerstone of Doc's act for over 15 years. The Color-Changing Deck-the stunning version that gets 'em watching! The Anniversary Waltz-the most commercial card trick ever devised. Max Maven's "Tearable"-visually stunning and designed to "work." The Cocktail Napkin Rose-worth the price of the video! Copper/Silver/Brass Transposition-widely acclaimed as the definitive version. The crowning piece-J.C. Wagner's Card on the Ceiling, Doc's closer for 20 years. Larry West's Bill Counting Trick- a long-standing undergound classic. I admit I'm interested in Bar Magic. But even if you aren't this series is something you need. If ALL that was on the disk was Doc's excellent adaptation of Anniversary Waltz it would be worth the price. But but add the effects: All Screwed Up, the Color Changing Deck-(think Chicago opener) and the Impossible Opener you have some powerful effects.I performed the last two yesterday evening when I was out and the really are workers. I do admit I got a migraine trying to figure out "Tearable", but I'll get it. SO:Chock full of effects. Excellent production quality. Well taught with Super Practice Sessions to highlight special moves. Care and practice are of course needed but no "move monkey" stuff. Having Michael Ammar to add his insights is a nice touch too. Add in Doc's performance tips and this is a "must buy". Anything with the name Doc Eason is going to teach you something. I really like the impossible opener, all screwed up and copper silver brass routines. Moves will take a bit but the response is worth all the work required. One thing for sure you will love the magic of Doc Eason. Add to cart the whole set. I use his tricks all the time in close up and walk around. Quality time tested material.